Many of our pivotal experiences of early adulthood can be traced back to clubbing. The low lighting, loud music, and thick, heavy air, come together to create an intoxicating mix that breeds a certain kind of self-discovery. Where else are we encouraged to let go of everything that holds us back, sink into the moment, and just be? Celebrating these fleeting, early-morning moments and the feeling of freedom and unencumbered joy that defines them is artist Lotte Andersen. 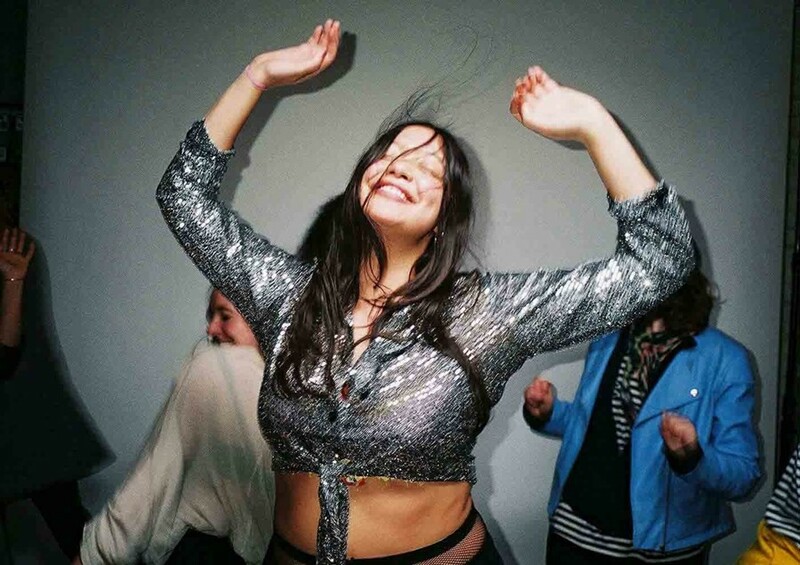 Inspired by her London club night, MAXILLA, Dance Therapy; Do it once do it right explores human pleasure seeking and the transcendent nature of club spaces by photographing people in a state of totally unabashed happiness. Previously featured at V3 and as part of Drawing a Blank in 2017, Dance Therapy; Do it once do it right is currently on display until 10 March at London's The Hive Holborn as part of Breaking Shells (curated by Justine Do Espirito Santo) at the Koppel Project. As it enters its final days, Andersen tells us more. What first inspired you to start the project Dance Therapy? Lotte Andersen: (Curator) Cairo Clarke approached me to participate in her curatorial residency Touch Sensitive at Yinka Shonibare's Guest Projects in March 2017. It had been well over a year since I had put my club-night MAXILLA to bed, but I couldn’t shake my fascination with personal and group clubbing dynamics. This project felt like the most natural way to tie in my art direction, casting and love of club culture post-MAXILLA. In Dance Therapy's first instance, I set up a moving image studio in the gallery space, once at Guest Projects, and most recently in the Turbine Hall at Tate Modern. Touch Sensitive asked the artists to explore and consider the female body as a database, leading me to reimagine the social and bodily ecosystems that exist within club spaces. I find the concept of physical therapy and bodywork interesting, and specifically the ways in which we can heal trauma through connection to the body. Dance Therapy was naturally informed by my own early explorations into club culture, music and dance. The club always felt like a site where I could be me and physically express myself in a body that I couldn’t always control. These experiences were so spiritual and visceral that I set out to try and capture those fleeting moments of euphoria and transcendence in a reimagined club space. How would you define Dance Therapy to someone who hadn't seen or heard of it? Lotte Andersen: Dance Therapy is an ever-growing exploration of group dynamics examining the human need of pleasure seeking, using the body as a site for transcendence and freedom. The project can be split into two parts. The first I call ‘capture parties’, where the public are invited to take part in the work. These become multi-channel video installations, where the viewer is placed within the work. In some ways, Dance Therapy seeks to confront the politics of taking up space, whilst requiring the viewer to simultaneously be part of it. Would you say Dance Therapy is an extension of MAXILLA? Lotte Andersen: MAXILLA’s primary function was a party; giving back to my local area whereas Dance Therapy is a research-based artwork, which uses my experience creating club nights as its primary research. I can see how Dance Therapy could be perceived as an extension of MAXILLA as it immortalises many facets seen in the club night, such as print work, sound recordings, immersive moving bodies. As an installation, the work acts as an immersive document of euphoria and hopefully communicates a sense of visceral surrender. How important do you find club spaces to be in terms of contemporary culture? Lotte Andersen: Everyone’s experiences are different but I cannot separate club culture from my sense of identity. I can pinpoint my formative experiences as a young woman in clubs, finding and forming facets of myself through music, dance, and contextualising myself very much within those environments. I perceive the simultaneous sense of darkness and light within those spaces as outlets for trapped or unprocessed energy. I believe very much in the resurrection of tangible, physical communities/tribes which seem particularly radical in relation to contemporary screen/online culture. How does Dance Therapy fit in with the rest of Breaking Shells? Lotte Andersen: Breaking Shells at the Koppel Project seeks to examine the body from a female perspective, with the show taking place in two parts. Part 1 at Baker street explores narratives and representations of the body, both from a historical and a contemporary point of view featuring work by Chelsea Culprit, Penny Goring, Rachel Jones, Jessie Makinson, Jala Wahid and Zoe Williams. Dance Therapy; Do it once do it right, is being shown in Part 2 at The Hive in Holborn alongside works by Hannah Perry and Shana Moulton. The second space seeks to create a space where the body can set itself free from the social and cultural constraints. I’m also showing a five-panelled black and white print, named “Body party, vingt-huits” which I made specifically for Breaking Shells. The print marked the first time I used my own body explicitly within my own work, exploring techniques of psychological disassociation from unprocessed trauma stored in my body both physically and emotionally. It also suggests ideas of fragmented and lost identity I felt through sustaining and recovering from a traumatic head injury over the last 6 months. What do you hope people take away from Dance Therapy? Lotte Andersen: With each new iteration, Dance Therapy reveals something new to me, altering its initial intention. People have left feeling elated, energised and optimistic, others described on a sensation of feeling surrounded and watched. It struck me how interpreting the experience of being surrounded by constantly shifting supersized moving bodies was totally dependant on who is watching.